This factsheet reveals how three private investors built tax-efficient ISAs worth over £1 million - request your free copy now. This factsheet is not personalised advice. 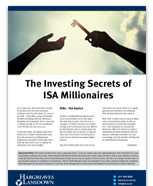 Download your Investing Secrets of ISA Millionaires factsheet - simply confirm the last three characters of your postcode below.